Azure Service Fabric Cluster targets have been supported since Octopus 2018.5. Azure Service Fabric Cluster deployment targets let you reference existing Service Fabric Cluster apps that are available in your Azure subscription. You can then reference these by role during deployments. The Service Fabric SDK must be installed on the Octopus Server. For details, see Service Fabric SDK. If this SDK is missing, the step will fail with an error: "Could not find the Azure Service Fabric SDK on this server." The PowerShell script execution may also need to be enabled. For details see Enable PowerShell script execution. After the above SDK has been installed, you will need to restart your Octopus Server for the changes to take effect. You need to create a Service Fabric cluster (either in Azure, on-premises, or in other clouds). Octopus needs an existing Service Fabric cluster to connect to in order to reference it as a deployment target. To learn about building Azure Service Fabric apps see the Service Fabric documentation. Once you have a Service Fabric Cluster application setup within your Azure subscription, you are ready to map that to an Octopus deployment target. Navigate to Infrastructure ➜ Deployment Targets ➜ Add Deployment Target. Select Azure Service Fabric Cluster from the list of available targets and click Next. Fill out the necessary fields, being sure to provide a unique role that clearly identifies your Azure Service Fabric Cluster target. After clicking Save your deployment target will be added and a health check task will run to ensure Octopus can connect to the target. 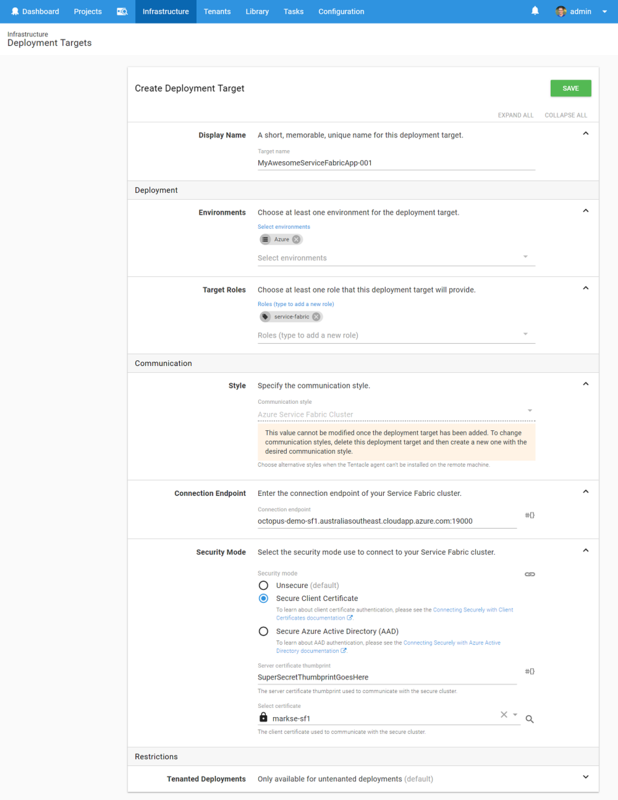 If all goes well, you should see your newly created target in your Deployment Targets list with a status of Healthy. If your Azure Service Fabric Cluster target does not successfully complete a health check, you may need to check that your Octopus Server can communicate with Azure. If your Octopus Server is behind a proxy or firewall, you will need to consult your Systems Administrator to ensure it can communicate with Azure. Alternatively, it could be the security settings of your Service Fabric Cluster denying access. Our deployments documentation discusses the various security modes of Service Fabric in greater detail. To learn about deploying to Service Fabric targets, see our documentation about this topic.